For one month only, we’ve teamed up with the London based Japanese inspired Bone Daddies to dish up the first ever Duck Egg Ramen. Noodle and ramen fans – this one is for you. 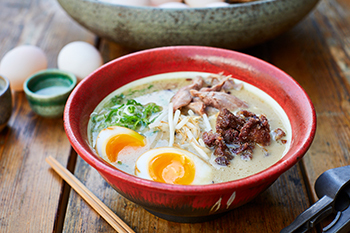 Described as rich, flavoursome and fresh, the aptly named ‘Duckkotsu Ramen’ is a bowl bursting with fresh egg noodles, shitake mushrooms, leeks and duck seasoned with chilli, bamboo and sea salt, and crowned with one of our Braddock White duck eggs. Inspired by the chef’s creativity and enthusiasm for quality produce and extraordinary taste, as a current supplier of our hens’ eggs we were delighted to partner with the group to produce the exclusive monthly special. And don’t forget to tag us on Instagram (@clarence_court) and use #itsaduckegg – we’d love to hear your reviews of this one-off special.